How can foreign molecules (the basis of prescription drugs) never found in any living thing on Earth be good for the long-term health of your body? Thankfully, Dr. David Brownstein, M.D., a renowned medical doctor who is the medical director of the Center for Holistic Medicine, identifies the most commonly prescribed drugs today that may be harmful to your health in his best-selling book, Drugs That Don't Work and Natural Therapies That Do! 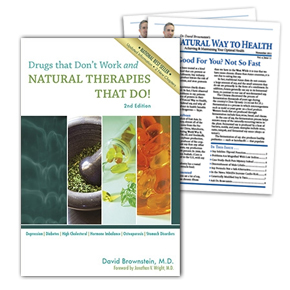 Dr. Brownstein's Drugs That Don't Work and Natural Therapies That Do! not only identifies worthless drugs but also reveals powerful natural therapies that treat some of the most common conditions Americans face today. In this easy-to-read book, Dr. Brownstein presents example after example of the dead-end road of patent medication use, with its inevitable health-damaging effects. Even better, he explains how prescription drugs only treat symptoms of illness and why you should consider natural therapies in your treatment program for these common obstacles to wellness.